Kindermusik of Clayton & Voice of Clayton OPEN HOUSE and DEMO DAYS events! Nothing lights up little faces like the songs, sounds, and activities in a Kindermusik class. Come and try one for yourself at DEMO DAYS, our upcoming OPEN HOUSE and OPEN REGISTRATION at Kindermusik of Clayton & Voice of Clayton in the Riverwood Cultural Arts Center. We are holding our OPEN HOUSE in conjunction with a worldwide Demo Days event occurring August 2nd through 17th in Kindermusik studios from Australia to Hong Kong, from South Africa to The Netherlands and from Maine to California! Our goal is to bring the joy of Kindermusik to as many children as we possibly can. Come and be part of the fun in our lovely studio! On Saturday, August 16th from 10:00-noon and 1:00-3:00 pm the studio will be open for you to try out a Kindermusik class, check out the home materials we will be using for this fall semesters classes and register for your choice of classes. 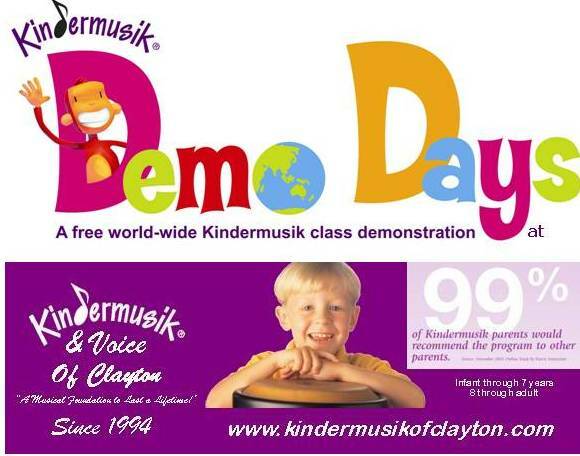 Register at our Demo Days event and take home a Kindermusik “Get Up and Move” CD plus $10.00 off your registration fee! We have Kindermusik classes for children 6 weeks through 7 years. As always we offer sibling discounts, our traditional core curricula or family style classes, and monthly payments. Demos are scheduled at 10:00-10:30am and at 1:00-1:30pm. Reservations are requested to provide the best experiance for you and your child. If we fill these two demos we will add two more immediately following. You may place your reservation by calling 359-0022 or 359-3473 or emailing us at kmclayton@mindspring.com by Friday morning August 15th. In addition on FRIDAY, AUGUST 15th in SMITHFIELD at ORCHARD HOUSE BOOKSELLERS at 117 N. Third Street across from the Smithfield Library we will have a DEMO DAYS event at 3:00 pm. Please call Becky Kinkade at Orchard House so they may provide the best space arrangement for our event. Her phone number 919-938-1511. Kindermusik focuses on early Literacy! On March 10th Today show host Ann Curry interviewed a family with a 17 month old who can read. She identifies complicated words and even cursive. Kindermusik is one such activity that helps your child’s interest in reading. Language skills are fostered with singing, sound imitation, and vocal play and Music & Movement Story Time encourages emergent literacy skills within the structure of the classroom experience. Our home materials, if used on a regular basis, give parents the tools to continue this learning at home. Kindermusik also offers Sign & Sing to families with children 6 months through 3 years. Check out Kindermusik classes for your child. You may be surprised at what they will learn in addition to music! Remember Kindermusik is a whole brain, whole child, whole body experience! Love You Forever! One of my favorites ~ enjoy! I loved reading this book to my children. Enjoy this video version! In this pre-Christmas, post Chinese-lead-fear, time I think it is very important to point out to parents some concerns regarding what they buy their kids for Christmas. Parents are looking for safe gifts that will benefit their children and create fun and educational kinds of experiences. Don’t feel guilty about not buying your toddler a Pentium, You may be doing the kid a favor. ANDREW LEONARD in a book review on Salon 21st writes…”When my soon-to-be 4-year-old daughter changed preschools a few months ago, I worried about the new school’s lack of computers. The old school had a Macintosh, and the kids would spend half an hour or so each day messing around with learning software programs and sending their parents unintelligible e-mail. But the new school was far from the computing cutting edge, and that made me feel guilty: Was I hindering my daughter’s ability to successfully compete in the 21st century? “Failure to Connect” is no neo-Luddite rant; instead, it’s a must read for anyone who cares about kids and computers. Healy is an educator with decades of experience, and she has researched her topic to exhaustion. Demolishing the hype of what she calls “technology pushers,” Healy delivers a hearty rebuttal to the conventional wisdom that declares that every child’s classroom and bedroom should have its own computer. Not only is there scant evidence that computers actually enhance “learning” in the very young, she argues, but there is good reason to believe that too much computer time can actively stunt the healthy development of a child’s mind. “Some of the most popular education software may even be damaging to creativity, attention, and motivation,” she writes. Bold words, and not ones that the “edutainment” software industry wants to hear. But they’re well worth saying. According to Healy, the market for edutainment programs for home use in the U.S. is growing by 20 to 30 percent a year. And just last year, school expenditures on technology reached $4.34 billion. Link above to the complete article…and I recommend this book to help you understand the safe use of computer software for your children and other ways of stimulating their brains to encourage the development of healthy learning. 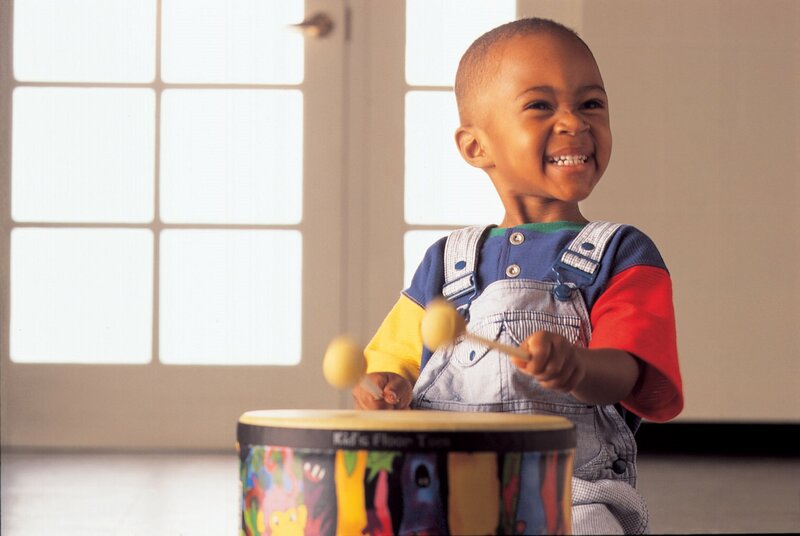 The alternative … recommend Grandma and Grandpa buy a Kindermusik semester and some fun rhythm instruments for your child! What could be better … quality time with your child in a FUN LEARNING experience! Here’s a “foundation of learning” (which we educators call “FOL”) . Did you know that stimulation of the calf muscle aids in language development? Put your child on the floor in front of you so that you can bicycle her legs. Then flex their feet and have your child just push against your hands as hard as she can. I think they just have fun trying to be as strong as you! But the work is good for their brains as well. It actually aids in the language development of children. Why? This information is in Carla Hannaford’s book Smart Moves, Why Learning Is Not All In Your Head. I recommend this book for anyone who wants to learn more ways to stimulate learning. This kind of stimulation of the whole body is why children need to be jumping, running, climbing, twirling, singing and dancing and playing in free, joyful situations. And this is why Kindermusik is such a good investment…your dividends increase exponentially. Thank you Yvette for your heads up! Aragorn and the Terrible Horrible, No Good, Very Bad Day! I have used Alexander and the Terrible Horrible No Good Very Bad Day as an Orff story, using glockenspiels and a variety of percussion instruments to enhance the story. Use your imagination as your read the following parady! The following was posted in The Poppins Classical Academy blog enjoy! 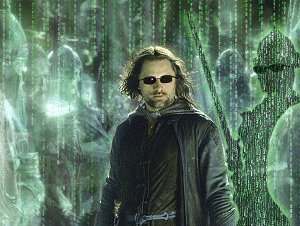 Last night when I went to bed I had aethelas in my mouth and now there’s aethelas in my hair and when I got up I tripped over my sheath and by mistake I dropped my razor into the sink while the water was running and I had to go to the Council of Elrond with stubble and I could tell it was going to be a terrible, horrible, no good, very bad day. At the Council, Gandalf didn’t introduce me and Boromir made faces at me and when I stuck my tongue out at him Elrond yelled at me for being rude and now I have to copy “My courtesy is somewhat lessened of late” 100 times and they still won’t let me reforge the shards of Narsil. When we left, Legolas got to lead a hobbit, and Gimli got to lead a hobbit, and Gandalf got to lead a hobbit, and even Boromir got to lead a hobbit, but I had to lead Bill the Pony. I said I was getting lonely. I said Bill was smelly and there were flies. I said, I am going to be sick. No one even answered. I could tell it was going to be a terrible, horrible, no good, very bad day. In the Mines of Moria Gandalf got to be the leader and Frodo got to talk to him and Gimli got to tell anecdotes and Legolas looked good in the dim lighting but I had to walk behind the hobbits and I don’t know what they ate for second breakfast but it made the rotting corpses smell good. I told everyone I was having a terrible, horrible, no good, very bad day and no one even answered. Then Frodo said that I wasn’t his best friend anymore and that Sam was his best friend and Gandalf was his second best friend and I was only his third best friend. I hope you sit on Sting, I said to Frodo. I hope the next time you get a strawberry lembas the strawberries all fall off and land in Australia. And Frodo said he was going to run away and never play with me again and then he did. And a gang of orcs attacked us and killed Boromir and now I have to run across a million-billion miles to get Merry and Pippin back. At Edoras Wormtongue was mean to me and Eowyn fell in love with me and wanted to kiss me. Yuck. I hate kissing. Gandalf only played with Theoden and said that we all had to go to Helm’s Deep. On the way wargs attacked us and one dragged me off the cliff and it felt like I landed in Australia. I could tell because at Helm’s Deep Legolas got to invent skateboarding and Gimli got to invent dwarf-tossing and Eomer and Gandalf got to invent horse-jumping but I broke a tooth. The dentist says I have to come back to get it fixed next week. Next week, I said, I’m going to Australia. But instead I had to go through the Paths of the Dead and now I have to lead a bunch of icky undead guys into a hopeless battle and then take them sailing and I always get seasick. If we do win, which we won’t, I’ll have to brush my hair and I hate brushing my hair because it gets knots in it. And I’ll have to marry Arwen and sing a song in front of all the Gondorians and Elrond will scowl at me because he always scowls at me. Gandalf says some days are like that. See how music affects children — and parents! This is a great article in the current USA weekend.com website…read on! Anyone who has bonded closer with a baby while singing a lullaby or witnessed the pure joy of a movin’ and groovin’ toddler will be intrigued by a growing body of scientific evidence indicating that music plays an integral role in child development. A 2001 University of Valencia study traced the connection back even further, noting that “children who were played music in the womb showed more rapid development” in traits such as speech, gross and fine motor skills, and the ability to imitate faces. Another study found that kids as young as 3 could interpret emotional messages of songs. “Children want to feel close and in emotional rhythm with their parents,” says child development expert Greenspan. We wanted to learn more about this fascinating link, so we sat down with two people who are well-versed on the topic of kids: singer-songwriter Laurie Berkner and child development expert Stanley Greenspan. The two shared their thoughts on why music is so important for children — and for their parents. USA WEEKEND: Dr. Greenspan, what role can music play in raising “great” kids? Greenspan: Great kids have a number of qualities, including empathy, creativity, emotional range, and a sense of morality and caring about others. It begins with that engagement, that rhythm between the baby and the caregiver — often the mommy — in the first year of life. Then it blossoms in the second and third years with more complex social interactions. When language comes in, they can give voice to what it means to be happy or sad. So a song like Laurie’s helps them understand what a happy feeling or a sad feeling is. You’ll see it in their doll play or action-figure play. This helps them with empathy and creativity. If they’re going to be great novelists or write songs or perform, they have got to understand the feelings of others. USA WEEKEND: Is it important for parents to sing and dance with their kids? Berkner: It’s really about enjoying interaction with your child. It creates more of a connection with the caregiver, especially if feelings are coming up through the music. If I’m going to get down and play with Lucy [her 3-year-old daughter with husband Brian Mueller, 39] while she’s listening to a song, and she’s jumping around and I seem to be enjoying it, too, I’m validating her experience. Greenspan: Children want to feel close and in emotional rhythm with their parents. It’s like when you’re with a good friend or someone you love very deeply. There’s a rhythm to the intimacy that makes you feel secure about yourself and the world. Listening to music brings people close; they’re sharing an experience. It’s an essential part of the development of empathy, of relating to others and emotional range. USA WEEKEND: Laurie, parents of children with autism and other special needs have told you that your music helped their kids express themselves, while other methods have failed. Any thoughts as to why? Berkner: The kids seem to want to be able to sing the songs. I’ve had lots of parents say that the first real words out of their children’s mouths came through stringing all these words together. Or they draw a picture to express that they want to hear a song. I wish I understood it better, but I like the fact that it happens. Greenspan: What Laurie says is very, very important. I, and many of my colleagues, have a whole program for children with autism and other special-needs conditions called the Floortime approach. The essence is to follow the child’s lead and interests [during play] to form a relationship. From there we build communication. We found that some of the kids are very gifted musicians. The part of their brain that processes music functions extraordinarily well. USA WEEKEND: Both of you make the case for learning through music, dance and creative play. Why? Greenspan: When you move, you experience more fully. The more coordinated you become, the more you’re able to enjoy movement. It enforces the creativity of using your body, whether through dance or music. But now there’s a movement toward more impersonal forms of communication, from rote learning in education to parents being told to use flashcards rather than creative play with their kids to the overuse of text messages or hours of isolated self-absorption rather than being with real people. Berkner: I think kids who are sitting at a computer are missing the physical component that they get through music and dancing. When they’re watching television, there’s at least a possibility they’ll get up and dance and let feelings come out. Think about “jumping for joy” — it’s the way we talk about our feelings sometimes. All of that seems to be so connected to being able to express ourselves. Sleepless in America by Mary Sheedy Kurcinka is Great! Did you know I sell Do-Re-Me & You musical products? check out this video to understand the importance I find in making musical products available to you! To order link to www.drmy.net/kmclayton and go shopping!